John Innes was born at Chapelhill in the parish of Mortlach on 23rd July 1888 the eldest son of James Innes and his wife Maggie. His father was a stillman at this time, most likely employed at a distillery in nearby Dufftown where John started school. It is believed he was one of the original staff members and moved to William Teacher's new distillery at Ardmore when in started production in 1899, his eldest son James starting at Kennethont School on 23rd May of that year. In the 1901 Census James and his family are living at No 1, Ardmore Cottages, Kennethmont where his occupation is given as Maltman. James became known locally as Matty Innes due to the local Doric pronunciation of the word malt -"mat". 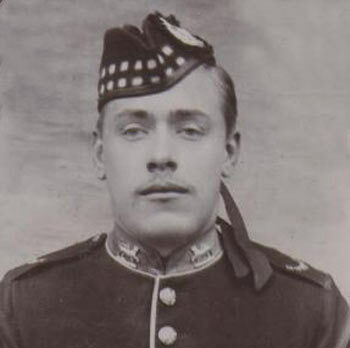 It is known that John had joined the 1st Battalion, Gordon Highlanders as a regular soldier possibly joining 1904/05. It is also known he was serving at Cawnpore, India in February 1912 as a member of C Company of the 2nd Gordons. His service number, 9993 was the same as he had in 1914. On leaving the Army John went to British Columbia, Canada. It was normal to sign on for seven years and on leaving a man remained on reserve for five years. During this period a man was liable for recall to his regiment in time of emergency. At the outbreak of the Great War on 4th August 1914 the Gordon Highlanders consisted of two regular battalions, the 1st and 2nd. 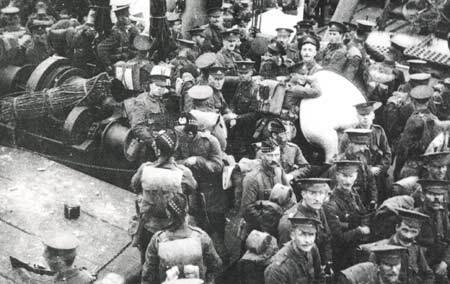 The 1st Battalion, stationed in Plymouth, land at Boulogne ten days later and took part in the initial actions of the war at Le Cateau and Mons, Belgium. The 2nd Battalion was stationed in Cairo, Egypt. During the next few weeks they made arrangements for returning the 1,000 man battalion, officers and it's equipment to the UK and reservists were contacted and instructed to report for duty. The battalion sailed from Alexandria bound for Southampton on 13th September and arrived there on 1st October, marching to Lyndehurst in the New Forest nine miles away where they joined 20th Brigade, 7th Division assembling there. It is believed that John joined the regiment at Lyndhurst having crossed back from Canada. He may have arrived at a Scottish port and visited his family before travelling to the Hampshire base. The 7th Division entered the fray the following week when they landed at the Belgian port of Zeebrugge on 7th October 1914. The Division ( known as the " Fighting Seventh" ) were to take part in the defence of Antwerp but as the German advance progressed swiftly through Belgium they were instead ordered to hold certain important bridges and other places that would help the westward evacuation of the Belgian army. Once the Belgians were through, the Division entrenched in front of Ypres, the first British troops to occupy that fateful place. There the Division took the brunt of the first Battle of Ypres, suffering grievous losses, between 19th October and 22nd November 1914.
on 6th October 1914 en route to Zeebrugge. For three weeks they held the line against a force six times its strength. The men endured a desperate battle to halt the German army in its attempts to take Ypres and move on to the Channel port of Calais. Following first Ypres the opposing armies dug in and the trench lines of The Western Front were established creating the infamous Ypres Salient. Although the size of the Salient was to change many times from now to the Armistice of 1918, Ypres and that small piece of Belgium around it never fell to the invader. Two VCs were won by the battalion during the battle. On 28th October the Gordons marched down the Menin Road and took over trenches at the Kruseik cross roads. The German assault on the line on both sides of the Menin Road began next day at 5.30am and during the next five days the battle raged during which time the German Kaiser was present at the front to stimulate his forces in one supreme attempt to take Ypres and move on to the Channel before winter set in. The assault, under cover of a thick fog, fell directly upon the Grenadiers, 2nd Gordons and Scots Fusiliers to the south of the road and the Black Watch, Coldstreams and Scots Guards to the north of it. By noon the situation seemed desperate when a series of incidents, in two of which the Gordons played a central role, brought about a marked improvement. "C" company , under Capt B G R Gordon has clung on in their original trench positions. The Germans had not anticipated their tenacity when they proceeded to mass a battalion within 300 yards of their position. Within five minutes their battalion was wiped out, 850 dead and wounded were later found on the spot. Nearer Gheluvelt some detachments in partial reserve, including 2nd Gordons, were under the temporary command of Major Craufurd of the Gordons. They opened a murderous fire on the advancing Germans who were thrown into confusion and brought to a halt. Craufurd's men charged the retreating enemy. On 31st Oct, 2nd Gordons were ordered to retire to the crossroads at Zillebeke. In carrying out the order they suffered severely from German Machine Gun fire. This order was later rumoured to have been given by a German wearing a British Staff Officer's uniform. A counter attack through Zwarteleen Woods was quickly organised and the Gordon Highlanders, now reduced to 300 men, in the centre of the assault cleared the enemy with hundreds of his force killed and wounded. In the aftermath, whilst 870 prisoners were taken, Lieut Grahame of the Gordons was shot dead by a German officer who had surrendered to him. At the end of The First Battle of Ypres the battalion strength had been savagely reduced with only 3 officers and 110 men reporting for duty at roll call. One of those who did not answer when his name was called was 9993 Pte John Innes who had been wounded in one of these engagements. The extent of John's injuries are not known but he will have received treatment in the organised process of medical care and evacuation that led from the battlefield to the rear. 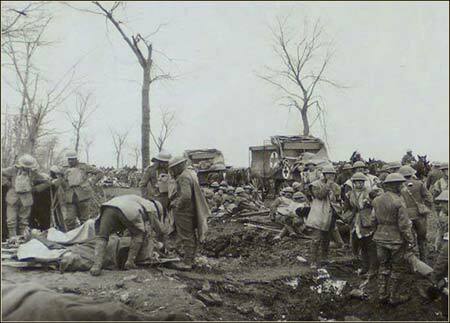 Casualties were taken initially to their Regimental Aid Post by stretcher bearers where they were examined and given basic First Aid treatment before being stretchered back to an Advanced Dressing Station. Here they were examined further ( wounded and walking wounded ) and their injuries classified before being sent back to a Casualty Clearing Station. There were a great number of CCS and they often specialised in particular types of injury. The doctors at the ADS would decide which CCS to send the man to. He would be moved there by ambulance ( motor or horse drawn) or along the network of light railways which moved men and materials to and from the front. A CCS was usually located at a main railhead well back from the front line beyond the range of enemy artillery and was essentially a tented hospital with operating theatres, etc. The lives of many seriously injured soldiers were saved at the CCS due to the skill of the doctors, surgeons and nursing staff. A considerable number could not be saved and military cemeteries in which they were laid to rest were established next to medical facilities. One such cemetery is at Lijssenthoek in which over 10,000 are buried. A number of clearing hospitals were located nearby from 1915 onwards. The sick and injured moved from the CCS to one of the many Stationary and General Hospitals established at main bases including Rouen, Abbeville, Etaples, Calais, Le Havre, etc to supplement existing civilian facilities. The injured were carried to them by vehicle convoy or special ambulance trains as some of these hospitals could be well over 100 miles from the front. Injured men were eventually shipped back across the Channel to " Blighty " to recover in numerous civilian and specialist military hospitals. The Red Cross established large numbers of small convalescent hospitals throughout the country, including one in the Mansion House at Leith Hall. This photograph was taken whilst John was recovering from the injuries received in action at Ypres. It was sent to his brother James who was also serving with the Gordon Highlanders. It is known that John returned to the Front in April 1916 as the British Army prepared for the " Big Push " that would become known to history as The First Battle of the Somme ( July - Nov 1916 ). It is likely he had returned to his regiment prior to this date, having recovered from his injuries, but had not been passed fit for overseas service. The battle was preceded by a continuous heavy artillery bombardment on the German lines which began on 24th June and lasted for a week. The wire will be destroyed and nothing will survive on the German line the soldiers were told. Get out of your trench and " stroll " across no mans land and secure the German line they were told. Reality was to be very different. When they " went over he top " at 7.30am on Saturday July 1st, 1916 that day was destined to become the blackest one in British military history with 60,000 casualties. The German line was far from devastated, as the men slowly crossed " no man's land " the defenders got out of their deep concrete bunkers, set up their machine guns and rained murderous fire on the advancing troops. Mechanised murder ! The battle began for the 2nd Gordons at 7.30am in trenches in front of the village of Mametz, which was their objective. Three lines of trenches had to be captured and crossed before the village was reached. Two companies reached the sunken road in front of Mametz by 8am but the other two companies, on their left, were held up by heavy machine gun fire from which they suffered severely. The troops in the sunken road came under extreme pressure and called for reinforcements. None was available, they were ordered to hold on at all costs. At 3.40pm they were reinforced by two companies of 2nd Warwicks. Together they stormed Mametz which was soon in their hands with 600 prisoners taken. The severity of the action can be judged by the Gordon's casualties : 16 officers and 450 other ranks, killed wounded or missing. The Gordons rested at Ribemont after the battle where they were greeting by the 1st Battalion as they moved up on 6th July. The two battalions bivouaced together at Bronfay Farm on July 12th, the first time this had happened since the Boer War in 1901. It is likely that John met up with a few old pals from his time in the 1st Battalion. John Innes and his comrades were next into action on 14th July at Bazantin-le-Petit where the Germans launched a heavy counter attack following attempts by 6th Devons to push them back at Mametz Wood. The Gordons came on the scene at 3.30pm and at 5.15pm one company advanced and cleared the village taking 22 unwounded prisoners. By 7pm the Germans had been driven out of the wood and the line restored by morning. They were relieved later that day. After the eventual success in capturing Mametz Wood the battle moved forward, in particular towards High Wood. However, the unexpected length of time it had taken the 38th (Welsh) Division to capture the Mametz Wood area, gave the Germans defending High Wood ample time to prepare for the British assault. This delay was to cost the British dearly, as Division after Division attempted to take the strongly defended wood during the months following. The first attacks on the heavily defended High Wood were undertaken, along with other units, by the 9th Battalion Highland Light Infantry (Glasgow Highlanders). On the evening of the 14th July 1916 the HLI went on the attack. Unfortunately, it was at this moment that the German counter-attack mounted from High Wood got underway and the Glasgow Highlanders came under withering fire taking very heavy casualties. The supporting battalions (1st South Staffords and 1st Queen’s) were forced on the defensive by the precision attacks of the German storming parties but nevertheless managed to enter the dark interior of the wood. The 2nd Gordons went into the line at High Wood with orders to capture two roads, Black Road and Wood Lane which ran SE of High Wood. This was part of an operation by the 7th Division to clear the enemy out of High Wood. They were finally driven out after two months of desperate fighting. After a barrage 8th Devons and 2nd Gordons started crawling towards Black Road 20 minutes before zero hour at 3.25am. When the barrage lifted they captured the objective. They then attacked the second objective, Wood Lane but almost immediately came under very heavy rifle and shell fire, one platoon reached it's objective, but was wiped out. The Germans had many machine guns and after an hour the survivors of the attack were forced to fall back to Black Road as they could not proceed. Reinforcements were sent up and the battalion was able to hold this position and consolidate it by nightfall. They were relieved the following day. After just three weeks on The Somme the battalion could now only muster a quarter of it's original strength. Casualties between 14-21 July- killed 29, wounded 183, missing 50. 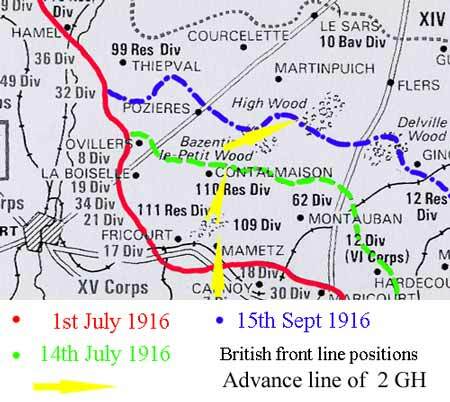 The final capture of High Wood was not achieved until the 15th September 1916. Even today there are parts of the wood which contain live ammunition and large areas would be quite unsafe to walk. High Wood was never thoroughly cleared of bodies and debris after the war. A conservative estimate suggests that it holds the remains of some 8000 German and British soldiers who were killed in action there. Among their number is John Innes who has no known grave and is commemorated with 74,000 other men on the nearby Thiepval Memorial who are also "Missing on the battlefields of the Somme"
Mr. James Innes, Ardmore Cottage, Kennethmont, was yesterday notified that his eldest son, Pte. John Innes, Gordons, was killed in action in France on 20th. July. Pte. Innes served with his company in India, and his time having expired, he came home on the reserve and proceeded to British Columbia. From there he was recalled when the war broke out. Pte. 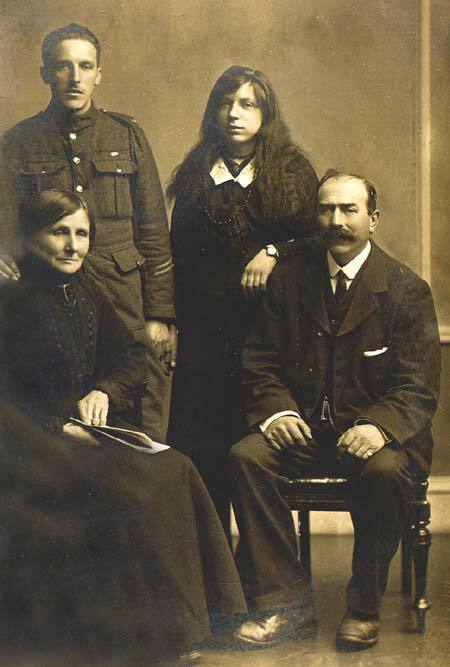 Innes was wounded in the battle of Ypres, and after being invalided home for some time, he again was sent to France in April of this year. Pte. 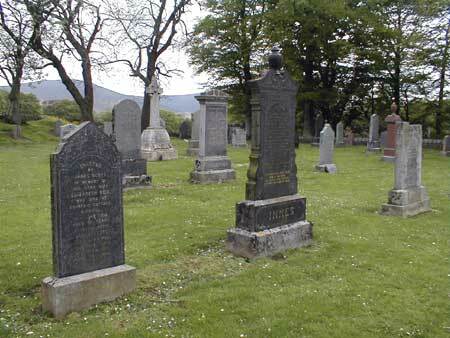 Innes was 28 years of age and unmarried. 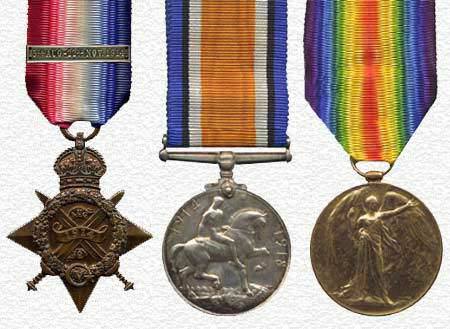 John Innes was awarded these medals for serving his King and Country in The Great War. Maggie and James Innes with James and Janet ( Netta ). Note James wears two overseas service chevrons on his sleeve. 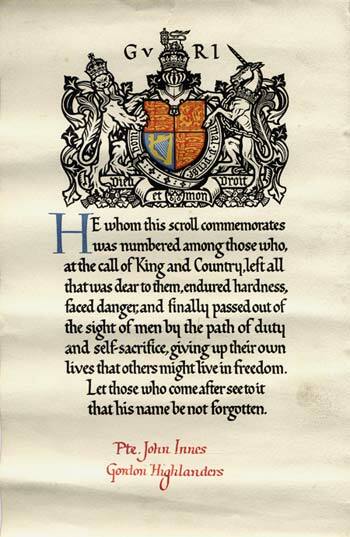 One was issued after Feb 1918 for each year a man served overseas. of his nephew Colin Horn.